There doesn't always have to be a special occasion to give your wife or girlfriend flowers. Sometimes, the sentiment means much more if it comes at a time when she needs a bit of cheering up. If your gal is having a bad day, gift her an arrangement of colorful blooms to give her the lift she needs. Sunflowers – These large, bright yellow flowers convey an energetic tone. Additionally, the look of the quirky blooms alone can put a smile on your loved one's face. Mixed color and flower arrangement – Mixed flowers also can be a nice gift when your lady is down in the dumps. Just choose an arrangement with pinks, yellows and purples to help lift her spirits. A summer bouquet, for example, with yellow Asiatic lilies, lavender statice, red gerberas, purple matsumoto asters and yellow daisies is full of color and energy. Work can make anyone stressed. When your wife or girlfriend is in the midst of a large project at the office, surprise her with a hang-in-there arrangement. Include a special note that helps reaffirm her confidence, like "You're doing great!" Gerberas – These cheery blooms are perfect to include in an arrangement for a loved one. Gerberas come in a range of colors to help brighten up the mood of any passerby. Feature these blooms with greenery for a bright and contrasting arrangement. Is your gal up for a promotion or on the final round of a job interview? If so, help give her an extra bit of motivation with a floral good luck charm. Single bloom – Full arrangements are great but sometimes the occasion calls for subtlety. A rose is a classic choice and is great for a romantic partner, but consider selecting a color other than the traditional red. A white rose, for example, can symbolize new beginnings. An orchid plant is another great choice because it can convey love, beauty and financial success, making it the perfect good luck charm. 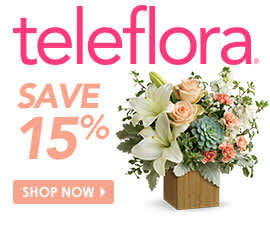 A thinking-of-you floral arrangement will score you major points with your special lady. It shows that your relationship is strong as ever, so send her a bouquet when she crosses your mind. Flowers plus a keepsake – Mixed bouquets allow you to combine a variety of her favorite flowers in one arrangement. Select roses, asters, chrysanthemums and carnations in a stylish clear vase. Complete the gift with a cute teddy bear. Why not thank your loved one for sharing her life with you? Send her a colorful thank you arrangement to celebrate the good times. Gift Basket – Pick an arrangement full of cheery sunflowers, gold cushion mums, burgundy daisies and yellow solidasters that come packed into a wicker basket. This way she will have a reminder of your thank-you gift long after the flowers wilt.